Happy Apple / Archive by category "Graphic design London"
London based Happy Apple Design was privileged to be asked to create an engaging animation for the dogs charity Dogs Trust. 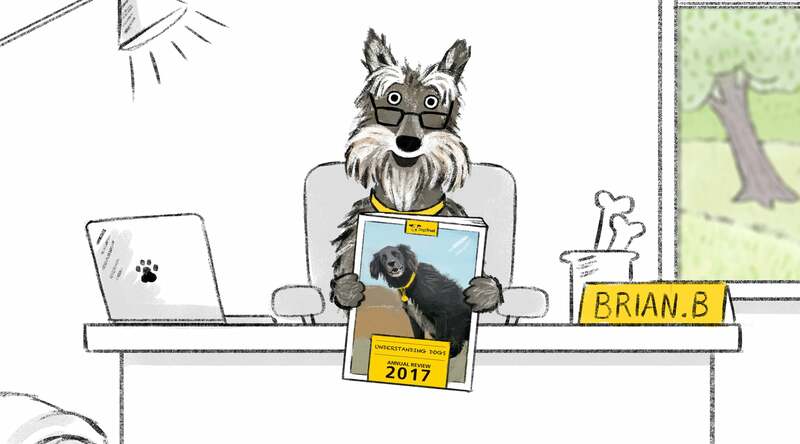 Focussing on the achievements the charity had made during the previous years we created Brian the central dog character, reading from their 2017 Annual Report in a deadpan voice, while animated dogs played and engaged in funny ways with the statistics and information coming up on screen. Included is a dog doing a bottom scoot, a dog gulping a bowl of biscuits in one go, dogs barking in the House of Commons, chasing squirrels, teaching a class good doggy etiquette and passing a dog school class with their human friends. 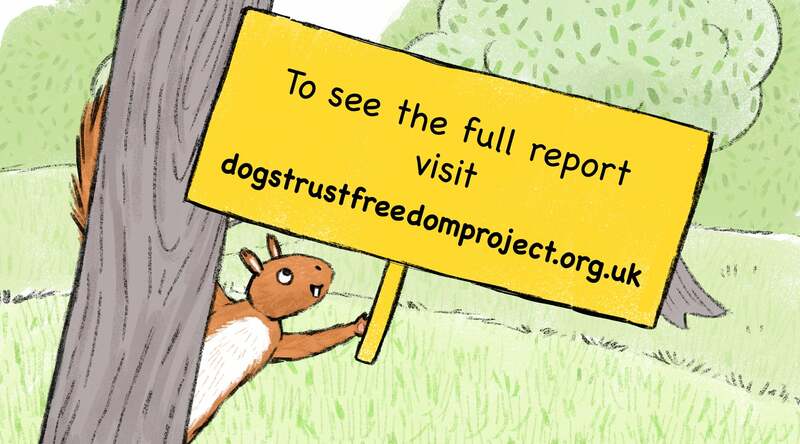 In the illustrations and cartoons we used a paired down colour pallet which highlighted the yellow and black of the Dogs Trust brand, and a naive line art style to add character and warmth to the animation. This project was a huge amount of fun to work on and we were really pleased with the end result. The final animation was pushed on social media, twitter, insta stories and facebook. Please view the actual animation HERE. Illustrations against Corporal Punishment: Unsaid Communications. Happy Apple were recently commissioned by London based Unsaid Communications, to create a set of illustrations to enhance three leaflets for schools and teachers explaining the dangers of corporal punishment. The leaflets are to be used by a selection of NGOs. The illustrations needed to work well across different ages, cultures and ethnicities. They also needed to describe a potentially sensitive and emotional subject without dramatising it. We adopted the use of naive figurative silhouettes, similar to those of Saul Bass, to visually describe the topic with a seriousness and delicacy. Public Health England were wanting to raise awareness of their new health tool app ‘One You’. To do this they wanted an animation and some still illustrations to post on their website and social media at the start of 2017. The tool needed to be on brand with the One You app and communicate with their target audience of 40-60 year olds, who were often caring for children and older relatives too and felt they had little time to build or prioritise excercise into their lives. The animation also needed to link the danger of diabetes with an unhealthy lifestyle. We created the images in the same colour scheme of the One You brand, and also borrowed the yellow footer line from the app to travel between the images and link them together. The client wanted a white board animation slant to the piece too, using the technique of a hand drawing and writing different elements throughout to add interest and underline important points (like the popular RSA animations). Once we had story-boarded the illustrations we went to a green room in Elstree Studios North London, and filmed the motion of the hand drawing which was then masked and laid over the top of the animation. As the film starts with a narration by Professor Muir Gray we thought it would work well to have the hand come in and draw over him as well, joining the two sections of the film. The film was launched on Facebook and social media in January 2017 and is being followed up by shorter campaigns in the same style going forward. Happy Apple Design recently completed a set of illustrations and bumble bee logo tailored for a new nursery school being sent up in Kensington. The images were to show the children in their London Nursery School uniform learning, eating, reading, partying and having fun. A map was also commissioned in the same naive hand drawn style to show the route to the school from the Underground and various bus stops. 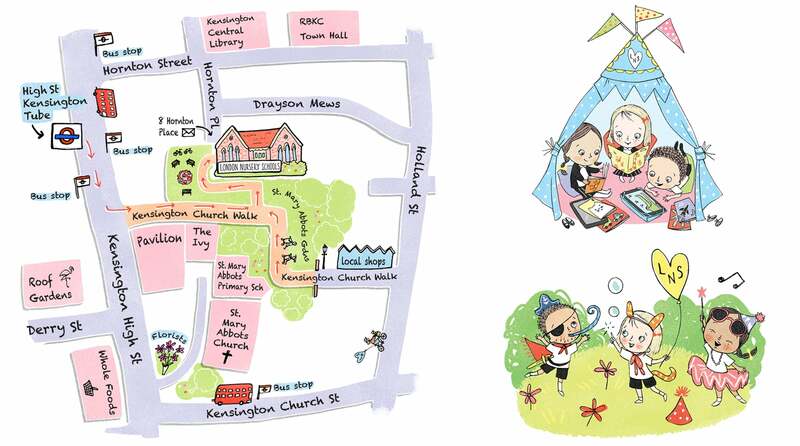 Using an illustrated map was a brilliant way to show the route to the school, which isn’t obvious from the tube or looking at google maps, and the client was concerned prospective parents would get lost. The bumble bee logo was a child friendly design and was utilised in different areas of the client’s website with animated gifs and games.